The most surprising aspect from Wednesday night’s opening round of the Missouri Class 5 playoff matchup between Lebanon and Lee’s Summit West wasn’t the bitterly cold temperatures. It wasn’t the 30 to 40 mile per hour gusts of wind that blew throughout the game. And it wasn’t the driving cold, hard rain that fell all night long. It was the fact that the Lee’s Summit West Titans gave up points for the first time since week six of the regular season. First things first, West, 10-1, used a ground attack, chewing up a total of 298 yards in the poor weather conditions to eliminate the Lebanon Yellowjackets 38-6. Now, a little history lesson. Going back to week six, the Titans allowed a field goal to the Truman Patriots in the first quarter of a 42-3 win. In the four games after that, West had not allowed a point, until Wednesday night. Even the game prior to the Truman game was a shutout. When you outscore your last six opponents 251-3 heading into the postseason, it’s probably well known that you have a darn good defense. But not to take anything away from what the Titans defensive performance, the weather conditions did dictate what each offense could, and in some respects couldn’t do. Only one pass was attempted all evening, and it wasn’t completed. So the running plays were dialed up on both sides. 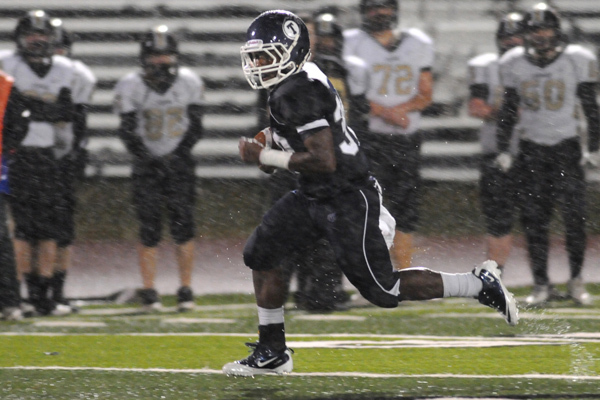 Titans senior running back Marcus Strickland didn’t let the weather conditions affect his performance. He sloshed his way for 224 yards and four touchdowns on runs of 62, 14, 32 and two yards. Now the Titans must travel south to Springfield on Monday, Nov. 7 to take on the 8-2 Glendale Falcons in the second round of the playoffs. “We’re going to start breaking them down because tomorrow is a Monday practice for us,” Boehm said of the quick turnaround.